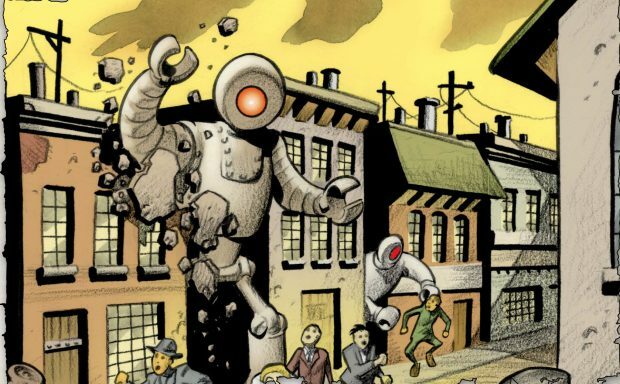 Gangsters, zombies, tragedy, comedy, and horror unite in The Goon, a multiple-Eisner-Award-winning comic strip that is making its way towards an all-new RPG adaptation. Currently on Kickstarter, The Goon has been adapted to Savage Worlds, an RPG system specifically built around this kind of visceral pulp action. The Goon is a lot of things: a comedy supernatural action comic, which describes itself accurately as “30s noir through the lens of a 1970s exploitation flick.” This mixture of gangland horror and zombie noir seems like a perfect combination with the Savage Worlds system, and the nearly finalized version Gamingtrend was able to review does not disappoint. Gearing itself towards a specific setting, The Goon RPG book spends a lot of time getting you up to speed on a series that has been running since 1999. For full disclosure, I am not familiar with the comic myself, so I can’t answer questions about whether stats are faithful to the source material. What I can do is tell you whether this book is an attractive product to someone who is not a diehard fan, and the answer to that is a resounding “yes.” The more complicated discussion is how well it adapts to Savage Worlds. The book begins with an overview of The Town, where the events of The Goon take place. It’s only a few pages, so you don’t have to read through decades of comic history, but you get a good grounding in what the setting is about and the major events that defined it. The one annoyance that starts here and carries through the rest of the book is the faux-gangster lingo. It clashes with the technical language needed to explain rules, and what it adds in flavor is helpful but grating as the book goes on. Calling all characters “lugs” is certainly thematic, but it also asks players to replace a familiar term. Following the main setting explanation, we get a listing of locations in The Town: a place of bright lights that cast dark shadows, all of which are full of 40s era motifs. I have a soft spot for early 20th century pulp, and The Town is a great example of why. This section is quick but effective. You don’t have to get mired in walls of text; each location has a short writeup to explain its major properties and give you some adventure ideas. The GM’s section has additional information for these areas, including secrets and encounters, to make using any or all of them an absolute breeze. Both sections lack a map of The Town. The designers probably did not want to limit your ability to tell stories in this setting, but it would have been nice to get an idea of what this space we spend so much time reading about looks like. We also get a starter adventure, which takes up a sizeable portion of the book. Whatever misgivings I had before, this adventure ties The Goon together in a package that is every bit as memorable as it is easy to run. Pinnacle Entertainment Group knows how to write adventures, and From Hell’s Heart is no exception. You do have to play second fiddle to The Goon himself, who is too powerful to be realistically playable, but if you can get past that you will be in for a great time. The adventure takes you to many sights and sounds of The Town so you can experience it for yourself and do battle with its vile inhabitants. The story maintains a focus on The Goon and things happening to him, which is a shame, but it also adapts very well to your individual party. There is room to be yourself in this game and to see the world around you change because of your actions. As you go along, you will have varied encounters involving investigation, exploration, social challenges, and, of course, dangerous battles. What comes next is a solid 38 pages devoted to smaller premade adventures. I applaud this inclusion; as a book meant to help GMs run a setting, it makes it effortless to understand what the setting is all about and fill it with interesting stories. This should be standard for any setting book. These small adventures are split between comedic and tragic stories, so you can set the right tone with your game. While they are intended to be integrated into the main adventure, you could use them on their own at any point. They are short enough for you to run on the fly but long enough to last a few hours each. While some are better than others, all of them are intelligently constructed to be useful for you however you want to play them. The Communist Airborne Mollusk Militia was my personal favorite, but there are some challenging mysteries here for those looking to do some sleuthing. There is also a series of tables you can use to create random adventures, and this alone could support surprising variety. As you might expect, we also get one of the most useful sections for game purposes: stats on stats on stats. The Goon RPG has writeups for the main characters, side characters, and antagonists of all shapes, sizes, and vile origins. You can use these in a Goon adventure or elsewhere, and with these imaginative enemies, you absolutely should. We also get some of the usual pieces necessary to any Savage Worlds adaptation: new edges, hindrances, equipment, and setting-specific rules. You will need the Savage Worlds Deluxe core book to play, but with its price tag of $10, the investment is well worth it. The only new skills are some additional languages for the strange creatures you are likely to meet and the Perform skill, which allows you to make money off of your chosen profession. Performance only explicitly lets you ply your trade for a fairly small amount of money, and apart from that, its use is not clear. The money you raise is also 1d6 dollars times the amount you make on your skill roll, which is a cumbersome way to arrive at the number. New Hindrances such as Corruption, Curse, and Perv all help sell the notion that you are not only not a hero, but on the bottom end of the power level scale. You are a down-and-out gangster in a world that stands against you, and this book doesn’t let you forget it. There aren’t very many of these, so you are likely to still rely on the core ones from the Savage Worlds book. The Edges, which enhance characters, are similarly thematic, letting you rely on Liquid Courage to make your way through battles or start with a good set of wheels for a getaway car. The majority of these edges are actually just stat bonuses, which make your character better but don’t really change the way you play. It’s a shame, because this is where the Edges could stand out to make the mechanics something really new. The book also includes a race creation table, which has much the same content as the same table in the core book. While it is laid out better by far to make it more readable, it is unclear why it was included. The only player races you are likely to add to the game have already been written up in the book, and very faithfully, I might add. The special Setting rules, which are intended to help tailor the Savage Worlds experience to The Goon, are similarly simple: Blood and Guts allows you to spend bennies to enhance damage, and Critical Failures make failure a more punishing event. These rules aren’t new, but they are effective to enforce the feeling that you are playing in a dangerous world. The GM’s section has additional optional rules that are specifically intended for use by antagonists. These parts are separate from the other character options for a reason: your players will be all the more wrapped up in the horror if they genuinely don’t know what’s coming at them. This is where we get the real meat of the book. New powers, new enemies, and new ways to enforce the feeling of horror. It makes the book a more worthwhile purchase if you choose to run the game, because otherwise you will have to sequester yourself from some of the book’s best information. Unlike Hindrances and skills, equipment is definitely more specialized to The Goon. Nowhere else in the many Savage Worlds that I know of can you find Inflatable Chickens, Garrote Wires, and Lobotomy Kits in the same book. This is one of the places that makes the book truly useful: helping you fill the adventures with appropriate gangster-level equipment. Some of the basic weapons are lifted from the core book, but that was largely for consistency to save you from having to switch books to get the stats for a basic shotgun. Once again, these equipment lists are easier to read than the tables in the core book, making them easier to use overall. We only get a few new magical abilities, but that is counterbalanced by a plethora of magical items that can curse your players or give them new tools to play around with. Maybe the most interesting new material is the Virtue system. You have to struggle to get your job done without losing your soul, which is far from easy when there are so many ghoulish entities that are after it. Similar to White Wolf’s humanity system, you maintain Virtue by doing virtuous acts or (more likely) defeating supernatural horrors, and lose it if you do unnecessarily cruel things and subsequently fail a Spirit check. Should you lose enough virtue, you begin to pick up insanities. The only way to lose these is by leaving The Town and seeking professional care. This system reinforces so much about what The Goon stands for: trying to find the line between hero and villain in a dark world. One odd feature to the book is the organization. Often, you will read a chapter of lore, followed by rules, and the two alternate in unintuitive ways. You would expect the two to have their own sections both for ease of navigation, but the layout for about half of the book is confusing. Of course, the art and art design are, top to bottom, spectacular. Many panels are pulled directly from the comics, but intelligently; they punctuate character introductions or story beats and help you understand the world you are entering. There are also higher quality pieces made specifically for this book that any fan of The Goon will find great joy in beholding. Locations, monsters, characters, and action shots all put you right in the action and mystery of The Town, but it doesn’t stop there. Each page looks pulled directly out of a newspaper pulp comic without losing any legibility. The Goon has style, and a style that is well worth checking out. The Goon is an action-packed adaptation of a well-loved comic that pays genuine homage to its source material while giving you all the tools you need to make the most out of your own game. Savage Worlds is a perfect fit for this zombie-noir setting, and the supplement book gives you everything you need to get started, whether longtime fan or newcomer.